For its third launch of 2018, Arianespace will use an Ariane 5 from the Guiana Space Center (CSG) in French Guiana to launch the DSN-1/Superbird-8 and HYLAS 4 satellites. With this 242nd mission utilizing an Ariane launcher, and the second this year with the Ariane 5 heavy launch vehicle, Arianespace once again serves the ambitions of two long-lasting partners: the Japanese operator SKY Perfect JSAT and the British operator Avanti Communications. The launch will be from the Ariane Launch Complex (ELA) in Kourou, French Guiana. 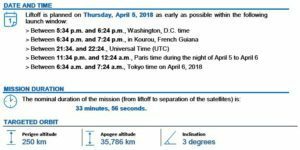 The Launch Readiness Review (LRR) will take place on Tuesday, April 3, 2018 in Kourou, to authorize the start of operations for the final countdown. DSN-1/Superbird-8 is the 19th SKY Perfect JSAT satellite assigned to Arianespace for launch. The most recent Arianespace launch for this operator was with JCSAT-15 in December 2016. On this dual-use satellite, the Superbird-8 payload is composed of high-performance Ku and Ka transponders and will provide satellite communications services mainly in the Japanese market. Located at 162 degrees East Longitude, it will replace the Superbird-B2 satellite launched in 2000 by Arianespace. The DSN-1 (X-Band Defense Communications Satellite-1) payload is associated with the Program to Upgrade and Operate X-Band Satellite Communications Function, for which the DSN Corporation – a subsidiary of SKY Perfect JSAT – has concluded a program contract with Japan’s Ministry of Defense. DSN-1/Superbird-8 was built by MELCO (Mitsubishi Electric Corporation), with manufacturing management by NEC Corporation, using a DS2000 platform. HYLAS 4 is Avanti’s third satellite launch, and marks its third with Arianespace from the Spaceport in French Guiana. HYLAS 4 will deliver high speed, reliable and secure satellite communications to Internet Service Providers (ISPs), Mobile Network Operators (MNOs), governments and satellite operators across Europe, through its Ka-band capacity. The high throughput satellite will also provide services in regions such as West and Central Africa, and with its steerable beams that provide services in Europe, South America, the Caribbean, and the Middle East. It is the 28th Orbital ATK-built satellite to be launched by Arianespace, a series that started with the TOPEX-Poseidon mission in 1992. To watch a live, high-speed online transmission of the launch (including commentary in French and English from the launch site), go to arianespace.com on April 5, 2018, beginning 15 minutes before liftoff. Follow the launch live on youtube.com/arianespace and on iPhones or iPads (the Arianespace HD app is free).